Quite a few years ago, while zapping, I stumbled upon some western action. 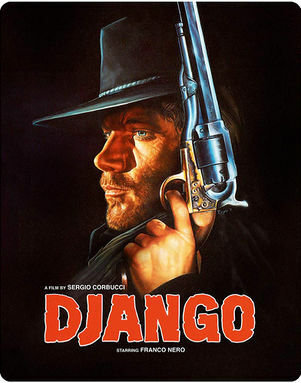 Being a western fan, I decided to stay with the movie. Some of the landscape looked like the locations used for the Winnetou movies, but the action was a bit tougher and there were no Indians in sight. 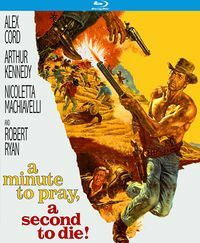 I was very surprised to find out afterwards that I had watched a movie directed by Sergio Corbucci. The movie's story is classic western stuff: a young man called Wes Evans (played by James Mitchum, son of Robert) returns to his hometown after the Civil War. He wants to marry his fiancée Nancy and settle down, but a range war has broken out between two families, and because Nancy thought Wes was dead, she has married the oldest son of one of the warring factions. Wes offers to act as a mediator and finally manages to restore the peace in the valley, but not before a series of bloody shootouts have taken place. 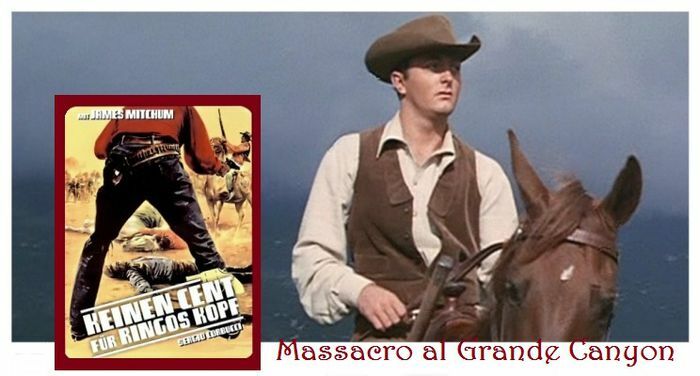 Massacre al Grande Canyon is Corbucci's first western, that is: if it's a Corbucci movie. There's still some discussion about his involvement in this production. 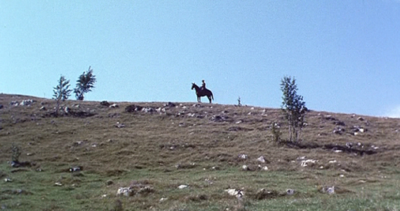 The most popular reading is that Corbucci was convinced by his personal friend (and co-producer of the movie) Turi Vasile to travel to Yugoslavia in order to help out producer Albert Band with the making of this movie; originally Band would direct the movie himself, but he gave up the plan shortly after shooting had started (1) . 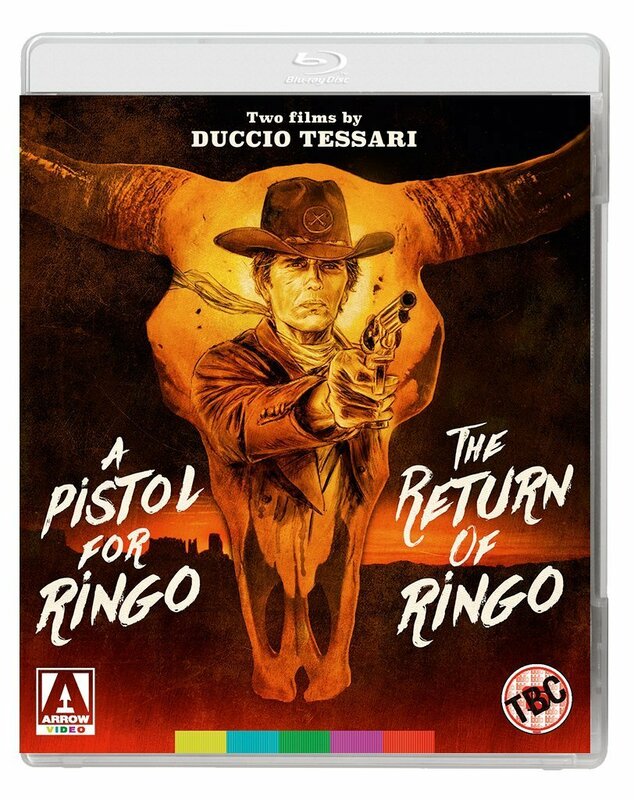 Apparently Corbucci has repudiated this theory in a interview, stating that he only directed a couple of isolated scenes (2). I don't know what to think of it. Many will be tempted to believe Corbucci's own rendition of the facts but Corbucci was a man of many stories and many versions of the truth. 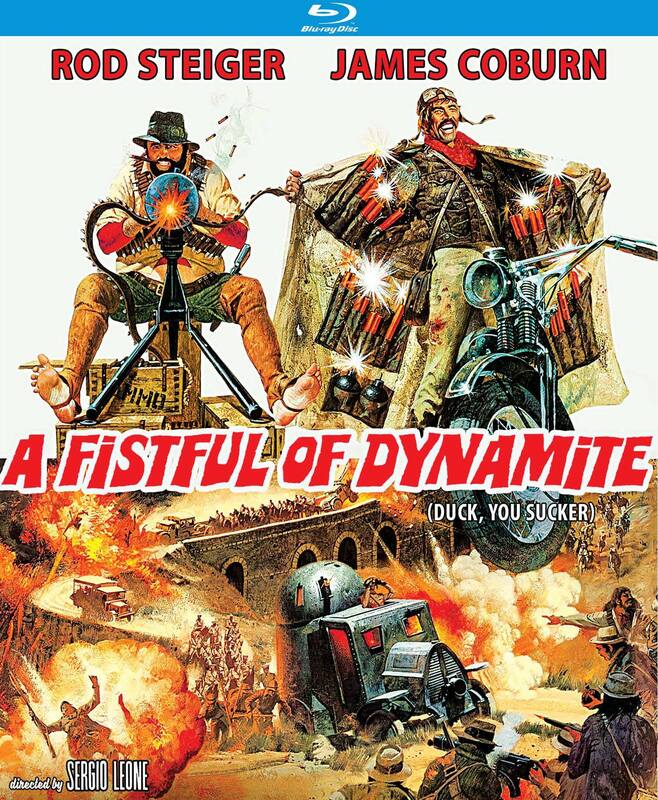 The script offers some elements that would define the spaghetti western genre, such as the warring factions with the man in the middle, the taciturn western hero seeking revenge, and the man coming home after a few years' period, finding his girl married to another. 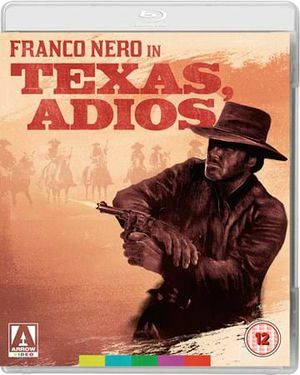 It's funny that most Italian critics sustain that the script is closer to a Sicilian proto-mafia story than a story set in the West, while 'foreign' critics have always underlined the American nature of the movie. The meandering script isn't very eventful and leaves the dispute between the two families underdeveloped. 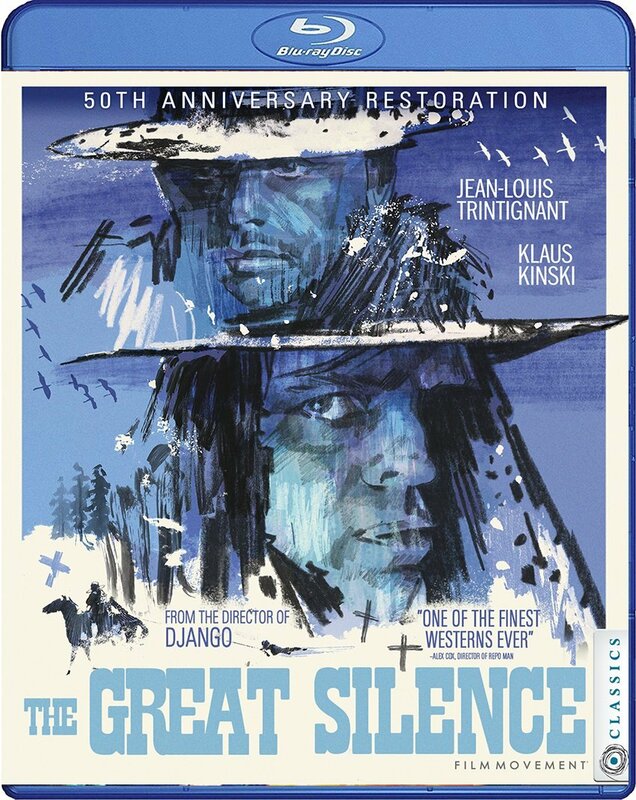 The film is mediocre at best, but there's one terrific sequence, a film in the film, and vintage Corbucci, starting with a gang entering the western town, filling the widescreen from side to side (a composition Corbucci would use again in Navajo Joe and Django), leading to a siege (probably in homage to Rio Bravo) that erupts, after a short silent moment, in a violent shootout in the town street at night (3). Overall the direction is anonymous and Jim Mitchum often looks a bit puzzled, as if he wonders what is going on (which was probably the case). His opponent Ardisson was offered to take over his part when a third of the movie had already been filmed, but he refused because he didn't want to hurt Mitchum's feelings (4). The film was shot in the Bruno Ceria studios near Trieste, most outdoor scenes were filmed across the borde, in Grobnicko Polje, near Rijeka. Director of photography was Enzo Barboni, who would later direct the Trinity movies. There's some confusion about when the film was made. 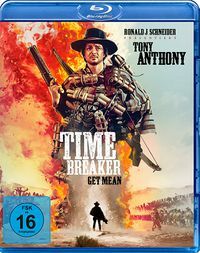 The evidence seems to show that it was shot in the spring of 1963; for this reason they had to use a western town built for the Winnetou movies. 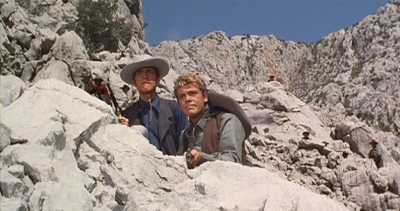 For Band's next project, The Tramplers, filmed in the second half of '63, the interiors were shot in the brand new western town of Elios studios. The film was released, without much success, in May '64. 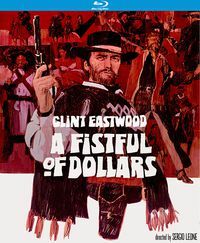 It was re-released in 1965, on a much larger scale, after Leone had created a western craze with his A Fistful of Dollars. How to watch it: The best way to watch the movie is the Koch Media release, Keinen Cent für Ringo's Kopf. It's not anamorphic but video quality is alright, even though there are quite a few flickering white specks that may become annoying after a while. There are two audio tracks: DD 2.0 Mono German and English, both unimpressive but adequate. Oddly enough the score is different on both tracks. Forum member Stanton has suggested that the second score was made for the new German dub and was created without any Italian involvement. Both scores are mediocre, by the way, like the movie. But watch that 11th chapter. (1) Marco Giusti, Dizionario del western all'italiana. This version is also sustained by Gianfranco Casadio in his book (Se sei vivo, spara! , Storie di, etc.) from 2004, and by Antonio Bruschini & Antonio Tentori in an article from 1998 on Corbucci's work, Sergio Corbucci, Fango, Sangue e Revolucion! (3) If you watch the Koch media disc, it's the eleventh chapter. This page was last modified on 25 April 2017, at 19:54.